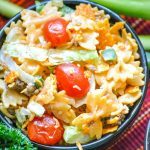 A creamy Tex Mex style pasta salad, this one features seasoned ground beef & a yummy Doritos crunch. Toss together the ground beef and taco seasoning until evenly combined. To a large mixing bowl, add the seasoned beef, pasta, onions, tomatoes, cheese, and lettuce- stirring until evenly mixed. Stir in the dressing until everything's evenly coated. Add the chips, and toss to combine. Serve immediately, or refrigerate until chilled and then serve.